I’m an Omnivore, I admit it. But, just cause I’ll eat almost anything or at least try, almost anything, it doesn’t mean I don’t like to eat meat-free from time to time. Really, I like meat-free meals. And yesterday I hit it out of the park. Well, I lobbed a good one. Wait, it isn’t baseball season just yet, but with the sun and everything outside, I’m getting anxious. Sorry, my mind wandered a little there, but I caught it before it escaped. We, as in the Senior Center, were given a lot of Green Peppers earlier in the month. 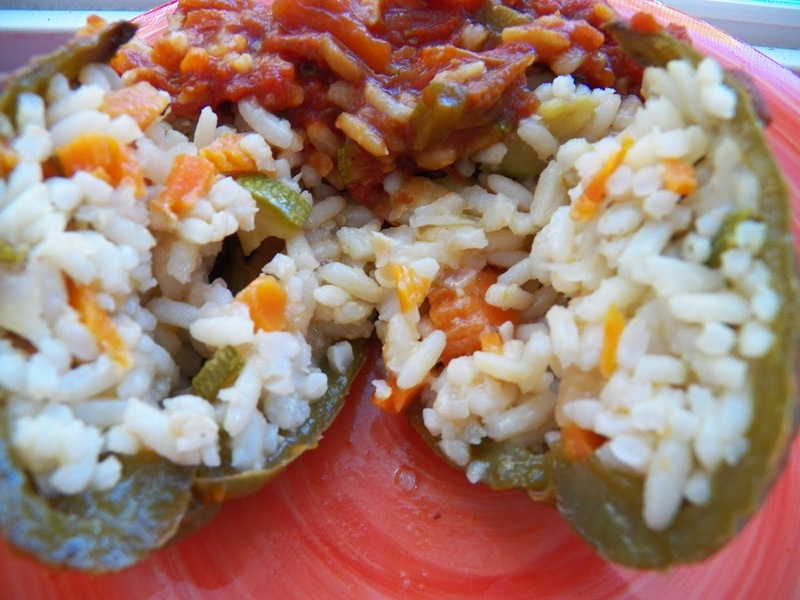 They were lovely, and we used some in a salad, we chopped up a bunch and froze them, and then I got the bright idea of making some Stuffed Peppers for our seniors. So we did. But, there are some vegetarians among us who don’t eat meat, and I wanted to make sure that they were able to have a great meal as well. So, I made a lovely filling, and stuffed them, baked them off, and served them. This was the solitary one that was left over yesterday, so I took it home and had it for breakfast. And I have to say, OMG, they were so good, and in fact, I’m planning a repeat, soon. But this time it will be a private party of one. And I’m going to go for a little healthier version as well. I plan on using some brown basmati rice. I wish I had pictures of the process to go with this, but, I was cooking against the clock, as usual. I took a couple of carrots, two small zucchini, an onion and a little garlic, sautéed them in a pan with some olive oil until they were soft. Sprinkled them with a little Badia Sazon seasoning, then mixed them in with about 4 cups of cooked rice. 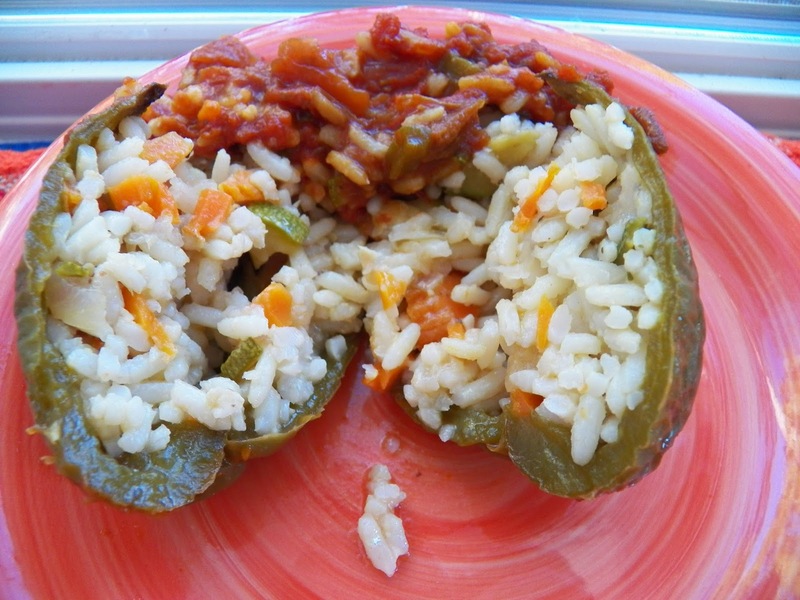 Stuffed them into some green peppers and they baked for about an hour, then we covered them. They were served with a dollop of Creole Tomato Sauce. And I’m going to try to recreate that recipe so I can share the how to’s on that, cause the flavour was out of this world good. And maybe I’ll add a couple of chopped up mushrooms as well. In Denmark a Kro is an inn which offers not only lodging but also meals. Some Kro’s are just inns, whereas others offer meals which can be, like many restaurants either really good or just so so. 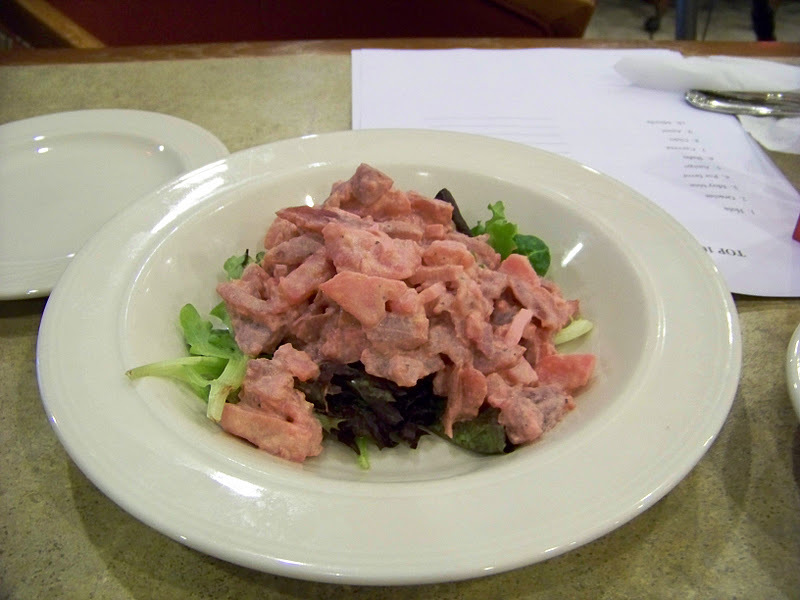 Many years ago I was lucky enough to taste this dish. My cousin got the recipe from a Kro they liked to go to from time to time, and she recreated it. Well, I was young then, but not a dummy. I wrote down the recipe, and somewhere in the process of living, I managed to misplace it. Well, you move a couple of times, put stuff in storage, it’s easy to lose stuff. I’m still searching for some stuff I know I had. One of these days, I’ll find it or not. In the meantime, I was looking for my mom’s recipe for Asier a few weeks ago, and guess what I found instead. A whole file full of recipes. At one time I had the delusion I’d actually write a cookbook and I’d actually made a good start on it, and this recipe was in that file. And when I read it again, my mouth started to water and I knew I had to make it. Could not find tenderloin that wasn’t already seasoned, so I got a nice piece of loin instead, and that was alright. And I found some nice red grapes, on sale so I used them as well. I think green grapes do work better, at least visually. I made this last week, and you know, it was as good as I remembered it. I think though, I will add some herbs to it the next time I make it, I think that would send it over the top. But in the meantime, this works. Heat olive oil and butter in a skillet til hot, then brown the pork medallions in small batches, setting them aside to rest while you brown the rest. Add water to pan, and scrape up all the little bits of browned goodies at the bottom. Add the meat, and let simmer for about ten minutes. Next up, add the onion, and simmer an additional ten minutes, then add the tomatoes and let cook another 5-7 minutes. Thicken the sauce with a little cornstarch and water slurry, then add the grapes and bring to a simmer. Simmer a couple of minutes and dish this up with some rice, either white or brown. This really is a quick and easy meal, and you can get the rice on and let it cook while the meat is simmering. The next time I make this, I am going to add some marjoram and savoury to the simmering meat. I think it will really punch up the flavour and make this even better. I got to try Venezuela’s national dish the other night, at least according to Wikipedia it’s the national dish. We started the meal with a Beet Salad, (which is going to go into my repertoire), Pabellon Criollo, Arepa’s and of course Black Beans and Rice. 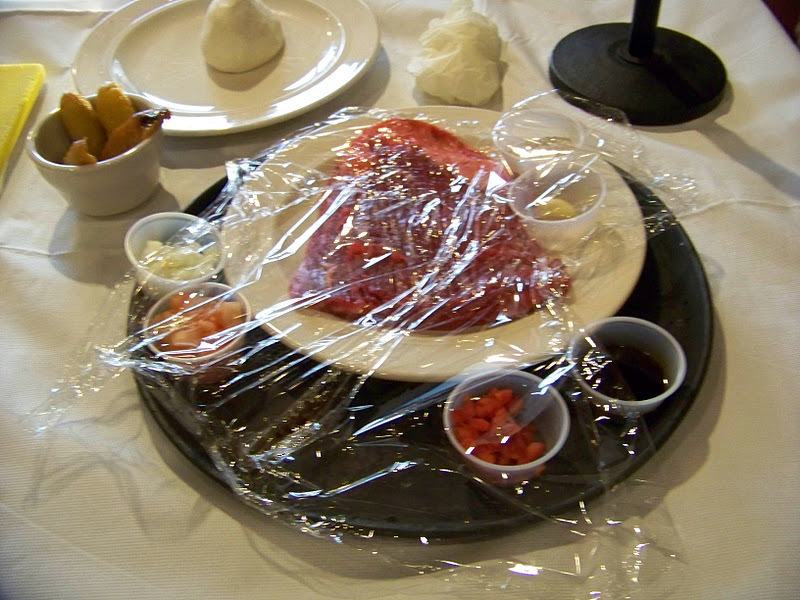 Personally, I could have made a meal out of the Beans and Rice, but the meat was very nice as well. 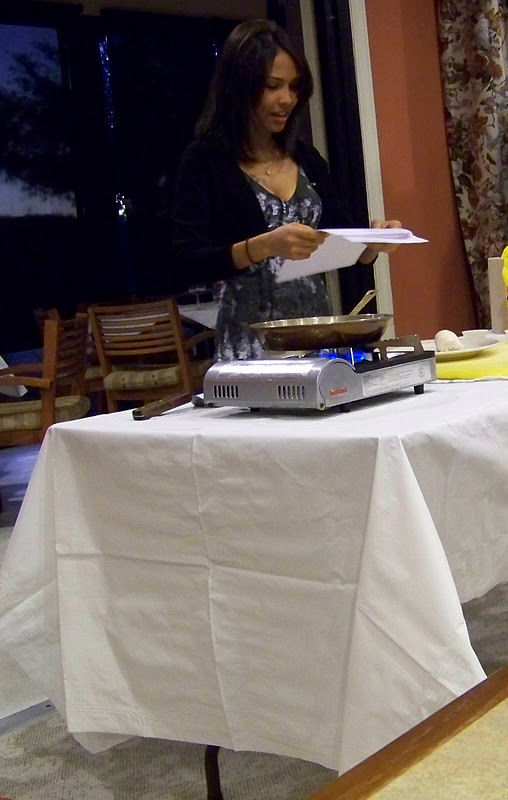 Carolina Narine was the guest chef this month and demonstrated how to make Arepa’s and Pabellon Criollo to us. I am going to be forever in her debt cause now I know how to make Arepa’s, and they are so yummy good. 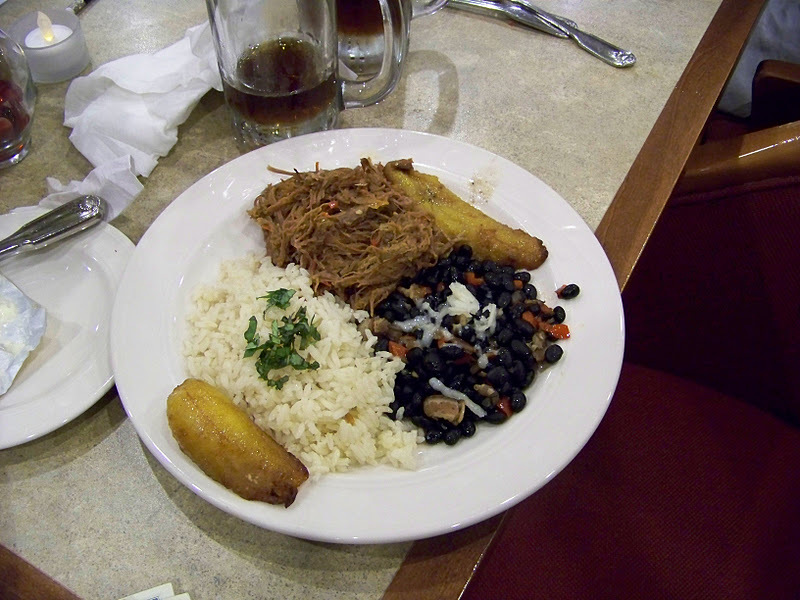 The Pabellon Criollo was excellent as well. Carolina was telling us about how to make Arepa’s and was looking to see if the recipe had been included in the recipe packet, but she gave me the recipe a little later. 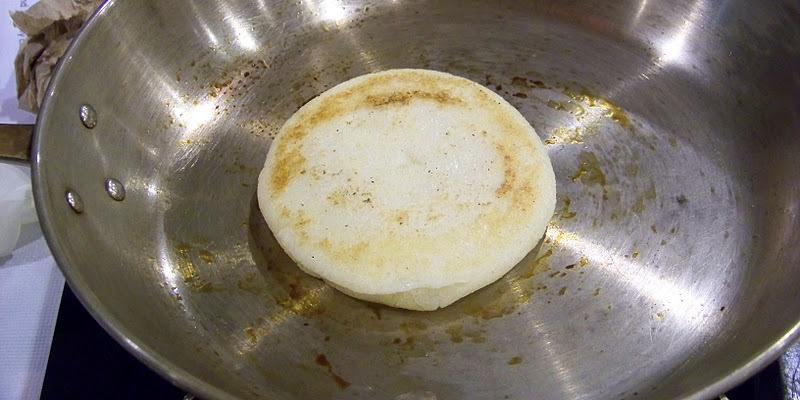 One tip she shared with us was to make a dimple on one side of the Arepa before cooking it in a little oil, kinda like you do when making a hamburger patty. This helps it to cook a little more evenly. After it’s browned on both sides, stick it in the oven to finish cooking. Here’s the recipe that Carolina Narine gave us for the meat. I do like these cooking demo’s, I learn so much from them. And get to expand my recipe file at the same time, it’s a win win situation. 1 Tsp. Italian seasoning if desired. Olive oil, sufficient for frying. Heat a pan with some cooking spray and drizzle in a little olive oil. Place your slices of eggplant into the pan and let it fry until browned on both sides. Place a layer into an oiled casserole dish, and then saute the mushrooms, when they’ve cooked a little place them on top of the eggplants, then top with slices of a thinly sliced tomato. You can sprinkle some Italian seasoning here as well if you like. I always forget to do so, but it’s an option. Sprinkle with some Parmesan Cheese, I used the powdered stuff in the can, but I think some freshly grated Parmesan Reggiano would go wonderfully here. Top it off with some grated Mozzarella Cheese or slices of fresh Mozzarella cover and place in a 350 deg. oven for at least 30-45 minutes. You can take the lid off and let it brown for the last 10 minutes to get a nice toasted layer of taste in there.